The Western Wall is one of the State of Israel’s most prominent symbols today as well as the focus of Jewish yearning throughout many generations, from the time of the Second Temple’s destruction by the Romans in the year 70 CE. The Western Wall has been a vivid remnant of the destroyed Temple for close to two-thousand years. Jews from all around the world have streamed to its ancient stones: community leaders and rabbis, as well as people who ascended to Jerusalem to stand in the shadow of its holiness. Today, the Western Wall serves as an inspiration to over ten million visitors and worshippers annually. The Western Wall Plaza is open to the public 24/7 throughout the year. The Western Wall Tunnels are subterranean tunnels that lead the visitor to the parts of the Western Wall hidden from view. The tour includes innovative exhibits, the largest stone in the Western Wall, the sacred site Opposite the Holy of Holies, and other fascinating discoveries including the Strouthion Pool. The tour is expertly guided and suitable throughout the year. The Tunnels are open Sunday to Friday. The Journey to Jerusalem – A new and unique experience! This interactive journey allows visitors to follow the path their family took while wandering around the world for the past 2,000 years – from the time of Jerusalem’s destruction until our return to it nowadays. Each visitor embarks on a different route based on his interactive choices. Come get to know your family’s past in a unique, interesting, and fun way in an ancient 700-year-old hall. The Journey to Jerusalem is open Sunday to Friday. Behind the Scenes – A new and fascinating tour! During development work in the Western Wall Plaza, subterranean spaces were uncovered that are fascinating, beautiful, and rich with remnants. 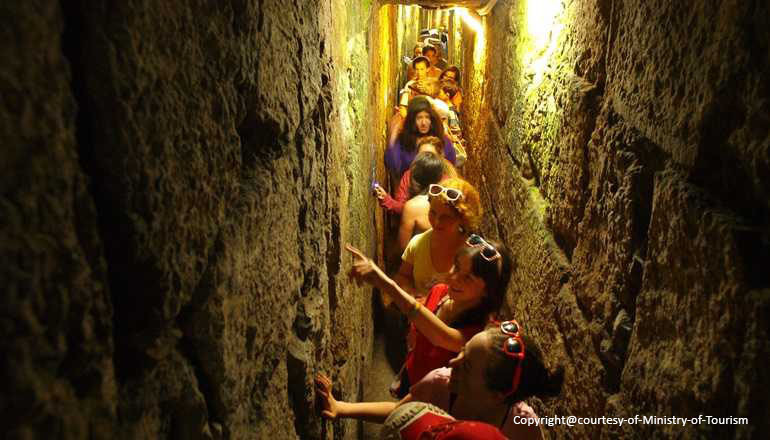 The Behind the Scenes tour includes a visit to the sites of recent discoveries and entrance to the rare spaces discovered under the classic Western Wall Tunnels route. This new route is the perfect experiential way to learn about 3,000 years of history. It is suitable all year. Behind the Scenes tours run Sunday to Friday. The story of the Jewish nation began thousands of years ago and is intertwined with the story of Jerusalem. This innovative center conveys the links in the Jewish chain of generations through glass art pieces weighing 95 tons in total, a play of sound and light, and a moving film shown in the Hall of Light which describes the liberation of the Western Wall by IDF Paratroopers. The Chain of Generations Center is open Sunday to Friday. For the first time in Israel, you can tour the Second Temple using state-of-the-art virtual-reality technology. The 360-degree tour allows you to be impressed by the beauty and power of the Temple that was destroyed 2,000 years ago. A Look to The Past is open Sunday to Friday.